Located near the Big Blue River of Northern Kansas, the city of Marysville was established in 1854. Marysville is also known for its historical background because it is located at the tail end of the Mormon, Oregon, and California Trails. Because of this, living here allows you to get a sense of what the city was like over 100 years ago. Not only is Marysville known for its historical background, it is also known for its amazing outdoor life. It provides many parks, and outdoor leisure activities for a family to enjoy. 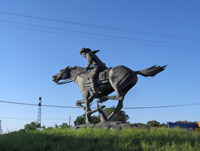 So, if you are looking for a city where you can easily learn about its ancestry and you love to outdoors, then Marysville, Kansas is the perfect location for you.